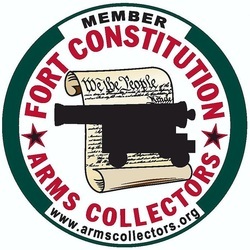 All membership applications must be approved by the Membership Committee before membership to the Fort Constitution Arms Collectors is granted. For a first-time membership application click here. For a renewal application click here. 2) FREE TABLES for selling and displaying at our MONTHLY BUY/SELL/SWAP meetings. 3) FREE ADMISSION to our BIG GUN AND KNIFE SHOWS. 4) DISCOUNTED TABLES for our BIG GUN AND KNIFE SHOWS. 5) EARLY “MEMBER ONLY” ADMISSION to our BIG GUN AND KNIFE SHOWS. 6) A VOICE FOR ARMS COLLECTORS & THE SECOND AMENDMENT IN NEW HAMPSHIRE.